The 3D Guns Controversy: Is Computer Code a Form of Speech? The Brady Center to Prevent Gun Violence is suing the State Department to compel it to produce documents relating to its decision to allow the blueprints for 3D guns to be uploaded to the internet. The Center alleges that they have not received the documents that they requested via FOIA five months ago. A federal judge extended an earlier-issued temporary restraining order blocking the Trump administration from allowing the blueprints for untraceable 3-D printed guns to be posted online until the case is resolved. The ruling is in favor of the attorneys general from 19 states and Washington D.C. who argued that the guns were a public safety risk. Despite the court order, the blueprints are still being distributed. Cody Wilson of Defense Distributed found a loophole in the judge’s ruling, Instead of posting the blueprints online for free, he is selling them to customers who name their own price, and distributed them via mail or email. A U.S. judge has blocked the planned release of Defense Distributed’s blueprints for 3D printed guns the evening before they were set to go online and set another hearing of the case for August 10, saying that the First Amendment ramifications need to be examined closely. In a lawsuit, eight states and the District of Columbia are asking a judge to block the federal government’s recent settlement with Defense Distributed, which will allow the company to publish the computer code blueprints to create 3D printed guns. The states contend that the plastic weapons are difficult to trace and would pose a safety threat to the public. In addition to the suit, 21 state attorneys general sent a letter to Attorney General Jeff Sessions and Secretary of State Mike Pompeo urging them to repeal the settlement. Other legal disputes have emerged as well. After an emergency court challenge in Pennsylvania, Defense Distributed must temporarily block download accessibility to users in the state. Cody Wilson of Defense Distributed is also now suing officials in New Jersey and Los Angeles for attempting to bring legal action if the blueprints are made available in their locations. And an attempt by gun-control groups to get a temporary restraining order against Defense Distributed was denied by a federal judge in Texas. In a landmark legal move, the United States Department of State and the Second Amendment Foundation reached a settlement that allows the digital files that can create 3D printed guns to be freely published. The State Department agreed to waive the prior restraint against the Defense Distributed, a non-profit organization that develops and publishes open source guns designs that can be used in 3D printing. 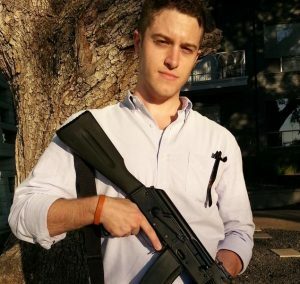 Cody Wilson, the founder and director of Defense Distributed, filed the lawsuit after he was ordered by the State Department to remove the digital files because they violated a law that controls exporting weapons without a license under the International Traffic in Arms Regulations (ITAR). Wilson sued the government for violating his First Amendment right to free speech. Wilson tells Ars Technica that after the files are published on August 1, he hopes that there will be a new group of people that could help fulfill his ultimate goal of unimagined, undetectable firearms. July 10, 2018: Pandora’s Box For 3D Weapons? In the 3D printed plastic gun case, Democrats and many liberals are invoking state rights arguments to create law and order, while many conservative libertarians are championing free speech ideals that would create a free flow of information. August 1, 2018: How Have Courts Ruled On Code As Free Speech? Bloomberg Opinion columnist Noah Feldman says there are two major questions at play in this case: is computer code free speech and is speech that instructs the public how to commit a crime subject to First Amendment protection. The former question he says, is not definitively answered by the Supreme Court, but the lower courts generally rule that code is speech. In regards to the latter, the legal landscape in the Supreme Court and the lower courts are not that clear. Fox News columnist and gun expert John Lott writes that restrictions on 3D guns violates the First and Second Amendment. He cautions gun-control advocates from making sweeping claims about the impact of 3D guns, because whether legal or not, the guns can already be created with little technical knowledge. The Washington Post breaks down the issue in a Q/A format and addresses whether this is a First or Second Amendment issue. Tim Worstall makes the case in the Washington Examiner that 3D guns were inevitably going to be legal, because the issue at hand is the export of the designs outside of the US, for which he says there is no reason to restrict the export because the 3D blueprints are going to become commonplace. Worstall writes that because of prior restraint, most speech, like the publication of the designs and downloading them, is permissible. “What happens next, well, free speech is part of that tree of liberty that must occasionally be watered with blood,” he adds. July 27, 2018: Is Computer Code Protected Speech? Despite Defense Distributed’s code soon becoming available to the public, the debate around free speech in the digital age is far from over, writes Allison Eck for NOVA Next. July 18, 2018: How Should The Constitution Evolve? Jacob Sullum argues in Reason against Steve Israel’s argument in the New York Times, writing that the Framers did not anticipate many of the forms of firearms that exist today, but that does not mean that the Second Amendment has no bearing on their constitutionality.